Watch a range of entertainment with some of the UK’s most popular video on demand services. This includes built-in apps for Netflix, YouTube and TV Player where you can watch all your favourite films and shows with up to 1080p streaming – all-nighter anyone? 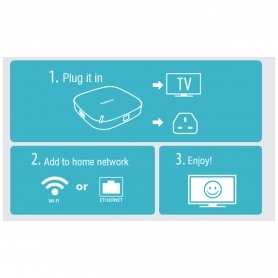 A 30 day free trial for Netflix and two month trial of TV Player are included in the box. On the Humax H3, you can also browse the web and listen to internet radio through your TV with the built-in Wi-Fi Dual band. Browse and play your media on the big screen from any device on the same network H3, which is DLNA, Samba and FTP compatible. Listen to music from your laptop, watch videos taken on your mobile or play films from your networked external hard drive. Alternatively, you can insert a USB and play back your collections of videos, photos and music. There is also an HDMI connection included. 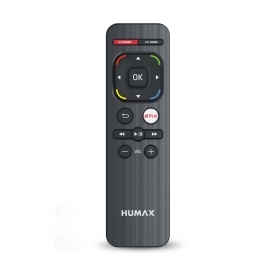 The Humax H3 comes with a stylish remote (batteries included), or you can even control the player from your mobile device. Download the Humax Cast app – available on iOS and Android – and you can move the mouse from your phone, cast your contents to the TV directly, and check all kinds of apps at a glance. 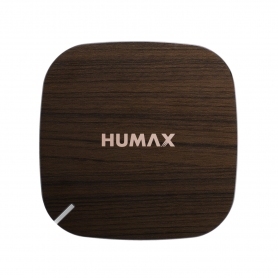 This Humax media player is the perfect partner for the Humax FVP-4000T PVR (sold separately). Pairing these two devices allows you to watch live TV through the H3 on any television, in any room, and without an aerial connection. The H3 Espresso uses the FVP’s multiple built-in tuners. If you want a true multi-room setup, you can connect up to four Espresso Media Players to a single FVP-4000T. Once connected to the FVP-4000T, you can use the Electronic Programme Guide to view and record programmes using its three tuners and hard drive. 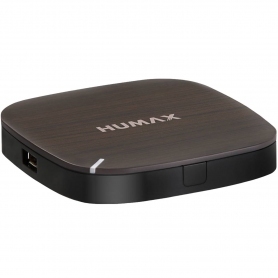 Expand your home entertainment with the Humax H3 Espresso Media Player – buy yours today. 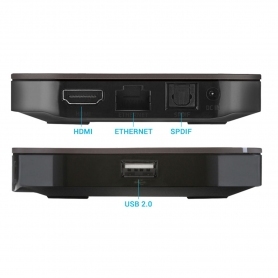 Product Description Smart Media Player - A new way to watch live TV & online entertainment.